Cianni Burgos dropped out of high school her senior year to care for her newborn daughter. Jack Williams encountered road blocks and was losing hope of graduating high school. Both were among the first students in Maricopa High School’s Ram Academy – a credit recovery program for juniors and seniors. 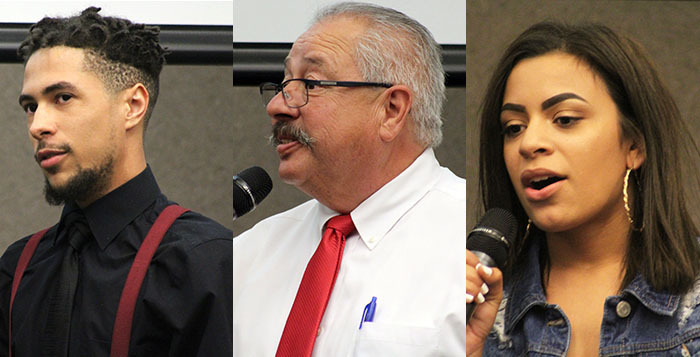 “I was at a point in my life where I felt like there wasn’t much room to go, and when I heard about Ram Academy I felt like that was my opportunity to get somewhere in life,” Williams said during a presentation to the Maricopa Unified School District Governing Board this week. Williams recently graduated, and Burgos will complete her final high school credit in May. The school-within-a-school at MHS opened in August 2017 and has since graduated 12 students previously at-risk of never receiving a diploma. Unsurprisingly, the school is an alternative from the traditional campus in many ways. At a maximum 125-student capacity, Ram Academy sticks to a 20-to-1 student-teacher ratio. The small staff bring with them big experience, according to the school’s administrator, Assistant Principal Steve Ybarra. “It is a team effort, and teachers make the program,” Ybarra said. The five “master teachers” are highly qualified instructors in their individual subjects, Ybarra said. Two of them are former principals, and another has experience in guidance counseling. Recruitment of the teaching dream team began last summer. “I told them in the interview(s), ‘I’m not going to question what you teach, I just want you to make connections with kids,” Ybarra said. “That’s the key. Making those connections,” Ybarra said. Math teacher Reid Martin is a former principal who moved from Kansas to teach math at Ram Academy. His wife is a teacher at MHS. He’s been tasked with incorporating the district’s new math curriculum into the program’s accelerated schedule – while in its inaugural year of operation. Despite the challenges, Martin said the students are thriving under the one-on-one attention from staff. Life outside of the classroom for many Ram Academy students threatened their ability to obtain a high school degree. Fifth-year seniors – students who dropped out senior year and have returned – are among Ram Academy’s most successful participants. “At the start of my original senior year, I was having my daughter. She’s now one and a half years old,” Burgos told the governing board March 28. The young mother said she nearly lost the drive to pursue a diploma. But then she enrolled in Ram Academy. She found small class sizes and thoughtful guidance when selecting courses. “I have a personal connection with every teacher I have, (and it) makes me so much more motivated to graduate,” she said. Her name and photo will soon be displayed on the school’s wall of fame – an encouraging tribute to Ram Academy’s graduates. A face already featured on the walls is Williams’. “I’m proud to say I’m a graduate and I’m expecting a son in the upcoming month, so everything is falling in place,” Williams said. A few of the academy’s students come from the foster care system. One, Ybarra explained, was a 17-year-old student who had no high school credits. Another student aged out of the foster system and was displaced from Maricopa. “The family didn’t want her anymore because they weren’t going to get payment, and so she ended up going to a group home on the west side,” Ybarra said. For three weeks, the group home funded a taxi to and from Maricopa to allow the student to graduate, according to Ybarra. “There was no way she would be able to start new someplace else and get any credit,” he said. Twelve additional students are expected to graduate by the end of the school-year. As the projected graduation rate at the academy grows, the program failed in its first year to promote college enrollment. Ybarra said attempts to schedule university tours for Ram Academy students this school year were unsuccessful. However, he said, military representatives have visited the school. The academy also encouraged students to take the Armed Services Vocational Aptitude Battery (ASVAB) test and the ACT standardized admissions test. He said the program hopes to coordinate with MHS Career and College Coordinator Bernadette Russoniello in the future to better promote post-high school education. Ram Academy operates in a few existing CTE classrooms and a modular building on the northside of campus. Ybarra said the limited space is adequate for the program’s small capacity – which he attributes to some of its success. However, Board Member Torri Anderson expressed her desire to see the program grow. In the future, Anderson said Ram Academy would ideally enroll freshmen and sophomores identified as being at-risk of becoming credit deficient. Ybarra said the program would embrace growth in enrollment, so long as Ram Academy could find a larger house of learning.